F1, probably without meaning to, has developed a season. That is, a season within a season. A bit like tennis has a grass court season (though the phrase always amuses me given it seems to consist solely of Wimbledon and some warm-up tournaments for Wimbledon), F1 now is in the midst of a mini-run of tracks all rather cut from the same cloth. We had Montreal, then the new-fangled Baku circuit, and the run is completed this weekend with the Red Bull Ring in Austria. These are each made up mainly of straights, some long, separately almost exclusively by slow turns. Straightline speed, braking stability and traction are the chief discriminators. It's not a phrase I've heard in a while, but the parlance once called such challenges 'point and squirt'. So therefore it seems we are now reaching the last part of F1's point and squirt season. Doesn't really have a ring to it, admittedly. Also showing how things can change, the image of the Red Bull Ring has over time shifted about as frequently as its name. Which is a lot. Of course, many of those of a certain age (which sadly I just sneak into) struggled for a time to forgive the place. Not so much for what it was, but rather - as was the case with the 'new' Nurburgring also - for what it replaced. In Austria's case it was the magnificent, undulating and fearsome Österreichring that graced the F1 calendar between 1970 and 1987, that was trampled underfoot by the new creation. While the beautiful Styrian scenery remained of course the A1-Ring - as it was re-named when the sport returned in 1997 - in contrast was achingly up-to-date, sanitised and standard. If only they'd built the new track somewhere else, we thought, perhaps up the hillside as ironically enough they did when the Österreichring itself was created in the stead of the even older Zeltweg venue. Still the place gave some good races, big crowds and - every so often - unusual competitive orders, but as we know in recent F1 that isn't enough by itself and the sport turned its back on the circuit for a time after 2003, and the venue then rather fell into disrepair (related to a proposed extension which wasn't completed). For a while its Red Bull owner didn't seem too interested in doing much to alleviate the situation, but in 2008 the company decided to bring the venue back to roughly what it had been (sometime around the same moment deigning to lend its name to the place) and other motorsport categories returned in the following year. And further aided by Dietrich Mateschitz's ready cash which can break down all barriers two years ago it was back as a Grand Prix host too. A rare occurrence of F1 returning to a broadly unchanged venue an extended period after walking away from it. And when we returned we got a demonstration of that time is a great healer. Or else that all things are judged in their zeitgeist. Suddenly the track had developed a well-worn charm in the age of the cavernous and soulless Tilke-dromes that had encroached in greater numbers onto the calendar in between times (although it again provides some irony as this track was in fact Hermann Tilke's first F1 effort). Heck I even heard Jenson Button when everyone reassembled describe the track as "old school". Aero efficiency - that is being able to get out of your own way on a straight despite the amount downforce on - and a power unit shoving plenty out, particularly at Spielberg's altitude which puts a bit more strain on the turbos, are crucial at this track and these of course suit Mercedes just so. Even though this circuit has a tendency to deliver tightly-packed grids, even some odd outcomes as mentioned - a combined consequence of a short lap and the relative lack of aerodynamic strain - the silver cars as ever look to be in the box seat. 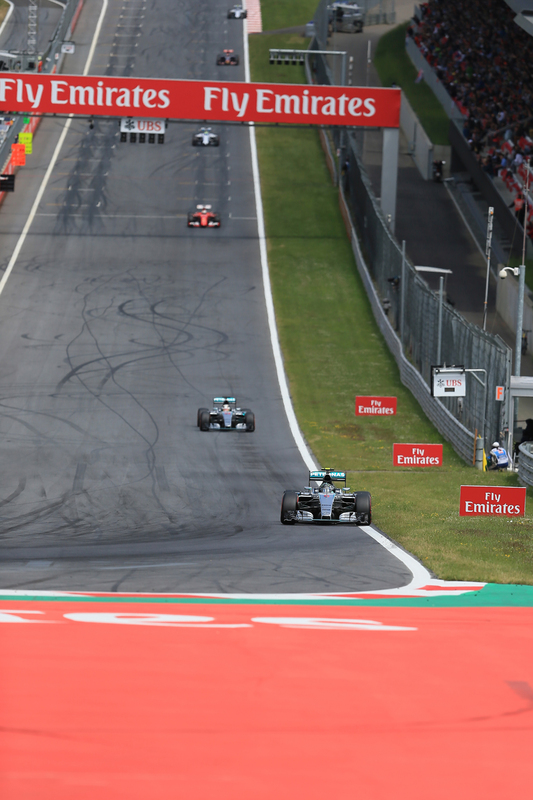 And Nico Rosberg having triumphed in the last round to extend his championship lead arrives at a track where he has triumphed in both of the visits since the sport returned in 2014. Last year too he was majestic here and perhaps surprisingly so, taking the lead from Lewis Hamilton off the line then edging clear, leaving his stable mate to pick up a penalty for crossing the pit lane exit line on the way to a slightly ignominious runner-up finish. Yet while for Lewis big braking zones are usually his thing he's actually not had a happy time here since F1 returned, and indeed he has botched both of his final qualifying efforts at this track, though it didn't matter too much 12 months ago as he got pole anyway in part because Nico botched his own last lap too. As for Merc's potential challengers, Ferrari for one is hard to read. 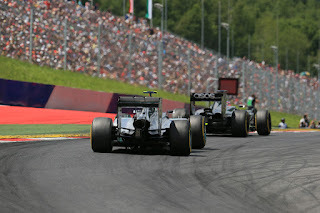 Based on Canada, as noted a similar track, it has a good chance in Austria of getting close to Mercedes in qualifying (the short lap should also help Sebastian Vettel to make mischief) as well as of jumping the Mercs at the start off the launch. And if a Ferrari does do this then anything can happen, particularly so here given as we'll come onto track position will mean a lot. But at Baku although Vettel salvaged second place the red cars were nowhere near the silver ones on raw pace. For Red Bull meanwhile at the track that bears its name matters are similarly obfuscated. While the Renault power unit still loses out a bit on the straights to most rivals the RB12 excels in traction and low speed grip which you'd have thought would really serve it well here. But since Monaco things haven't been nearly that simple. 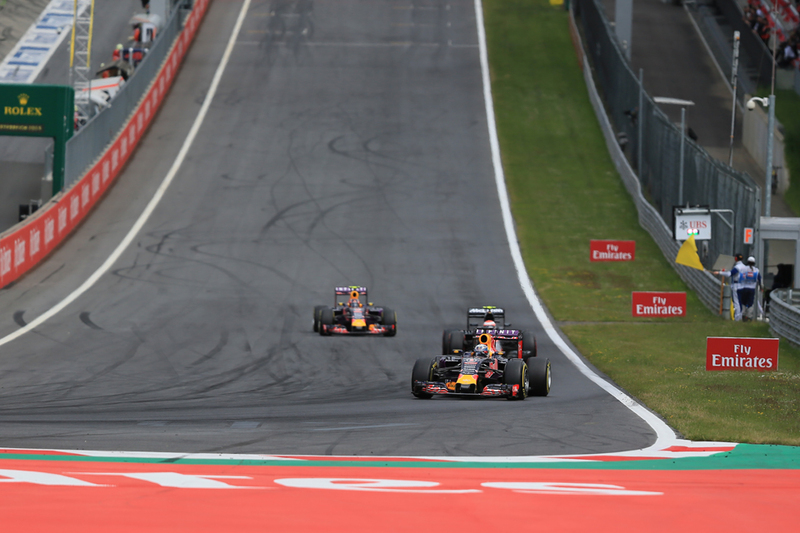 The team not least needs to get on top of its tyre woes witnessed in the last two races, that Christian Horner has admitted are simply baffling the squad. It'll at least surely experience an improvement on last year in Austria when it decided to swallow engine change grid penalties and therefore knew in advance that both of its cars would start from near the back. As in Canada and Baku the other Mercedes-powered cars should be well-set this weekend, and perhaps particularly so in the case of Williams this time. 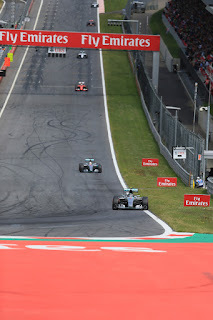 Its previous here is strong - in 2014 the two Grove cars locked out the front row indeed as well as ran the Mercs close in the race, while last year Felipe Massa, albeit much more distant from the lead this time, got onto the podium. But Force India also tends to go well on these sorts of tracks - remarkably its two cars have finished P6 and P9 in the last two Spielberg visits - and its recent pace, seen quintessentially from Sergio Perez in Baku, has been highly impressive. And with two podium finishes in the last three Checo surely is once again worth a watch. Last year here comfortable one-stop strategies were de rigueur and this is likely to be repeated even though, just as in Canada, the ultrasoft compound is available this time and many drivers have piled high on them. One-stoppers were rather the thing in similar Montreal and Baku and likely would have been the thing in Monaco too prior to those but for the weather. Other than where there are long turns it seems the Pirellis hold on pretty well these days. Usually the main tyre concern in Spielberg is graining and this has tended to manifest itself lately in cool conditions. This all assumes it stays dry of course. Yet weather in Spielberg usually has but two settings - hot and sunny or else monsoon with nothing much in between - and the switch from one to the other is sometimes in a blink. At this stage forecasts also obfuscate matters, with some suggesting showers are possible in all three days. 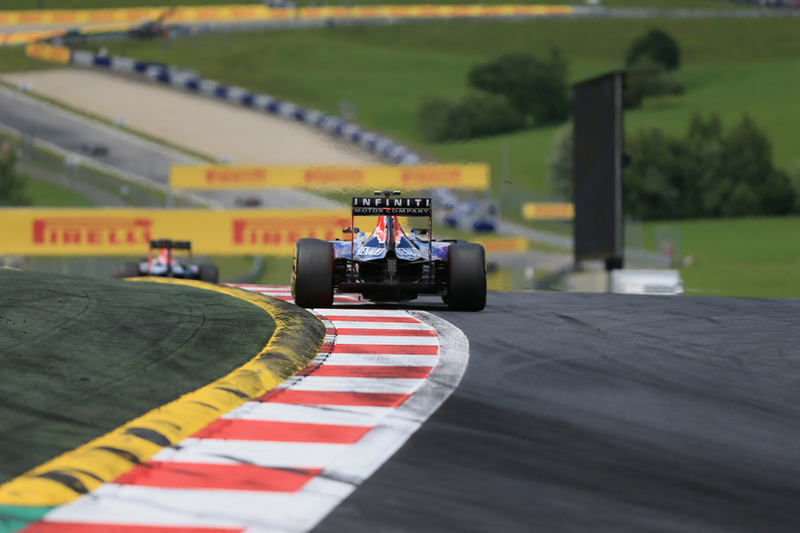 Despite appearances the last couple of Austrian races have indicated that overtaking isn't too straightforward here, though the uphill braking zone at turn two after a long straight is the best opportunity. Qualifying will count for a lot, not only with as mentioned one-stoppers likely but last year tyre warm up was tricky which made undercuts not as effective as usual in gaining places. The challenge here is getting even warm up between the front and rear tyres, as the traction zones ensure the rears heat up quickly but the fronts may not come in so rapidly, which will be a particular concern for the long double-left in sector two. Still, it'll be worth watching those starting outside of the top ten as Pastor Maldonado last year and Perez the year before got good points hauls on a contrary strategy starting on a harder compound. At this track for the reasons given and more grids can be very tight and the unusual can perhaps be expected; even small mistakes could have lasting reverberations. 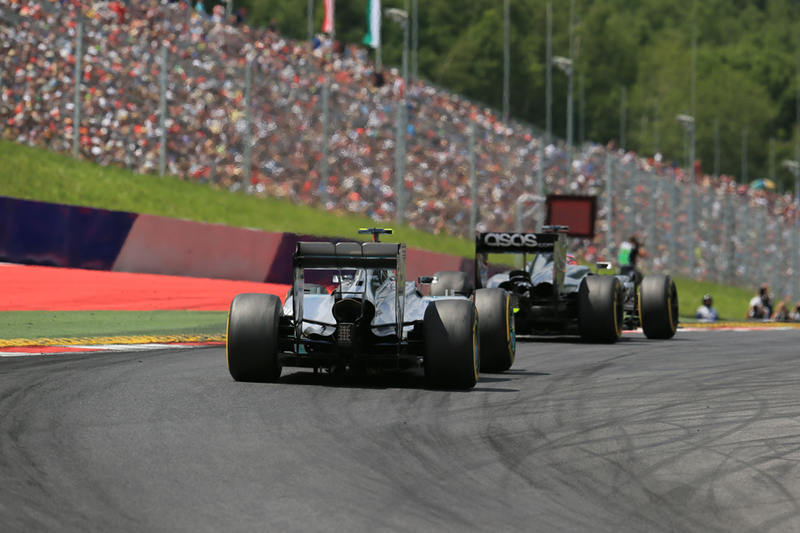 Merc should be on top again this weekend, but at the Red Bull Ring things are not always that straightforward.